Oct 29/2012 - It seems the Ubuntu 12.10 LIRC service script has changed to assume a driver cannot both send and receive (ie transmit and receive remote signals), so the Ubuntu Remote Control Configuration utility doesn't work correctly. Check out the sample files in Ubuntu 12.10 Downloads, and just change the lircd.conf to include your remote(s) and transmit target(s), run "service lirc restart" (or reboot) and you're done. Need to control (multiple) Pace set-top-boxes? Use CommandIR Utilities with Pace codes. The Motorola VIP1200 uses the same code set. 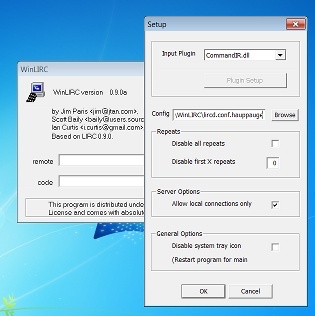 Nov 21/2011 - WinLIRC 0.9.0c release today - now supporting CommandIR III! Use any remote with Windows apps like EventGhost, Girder, or make your own scripts. Universally supported remote decoding and control! CommandIR Control Technologies is a division of InnovationOne Applied Technology. (C) 2006-2012, All Rights Reserved.